Never thought I’d actually find a bottle, but there it was, coated in bright pink paint, which made the guy at the cash register ask, “What is this, Pepto-Bismol?” It startled me, and all I could think to say was that I’d probably need some Pepto-Bismol later, because of the doughnuts and the bacon. I might’ve also used the phrase “breakfast in a bottle” and given him two thumbs up. At that point he started staring at me like I had a bomb strapped to my chest, so I backed out slowly and vowed never to return. And that’s the story about the time I got confused at Walgreens. Price Range: 13 bucks a bomber, last time I checked. This ale, which started as a porter but apparently metamorphosed into a brown ale during brewing, pours a lazy brownish red, like lightly tarnished bronze. Foam rises reluctantly and recedes fast. The beer’s body seems lackluster and even a little … oily. OK, maybe the smell will hook me. It’s all bacon. And I mean all. That’s not a complaint, as my ideal food pyramid consists of one large pyramid-shaped section filled with bacon strips, but it’s extremely unusual in a beer. The smokey pork aromas (it feels really weird typing that) are backed by a faint maple syrup sweetness. There’s also something rich and boozy beneath the piles of bacon, like brown sugar, spiced rum, and sweet fried bread. But the bacon is overpowering. I’ve never smelled anything quite like it. Except actual bacon, of course. The taste lives up to the intensity of the smell, which makes things a little confusing. The sip starts off sweet with candied maple syrup, but then the bacon comes roaring in. Instead of tasting deliciously smokey, however, it’s a little … burnt. 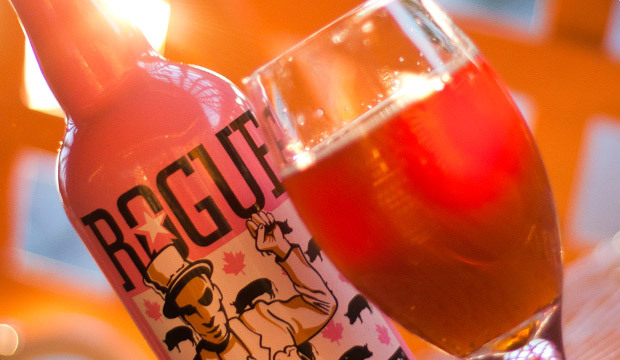 Rogue used real bacon to make this beer, but I think they might’ve cooked it a bit too long. The body is thin with spicy carbonation, emphasizing the unbalance between the flavors. Now, I love sweet beers and I love smoked beers, but the way the two styles are blended here seems off. The aftertaste, however, is glorious. A few seconds after swallowing, your mouth will be filled with the tangy taste of meat (did I just type that?) as if you really just ate a strip of bacon. Enough can’t be said about how awesome it was. It made me feel like a mad scientist who just perfected a liquid bacon recipe without all the hassle of chest pains and having no friends. This beer has a lot going for it. There’s the bacon, for instance … but also the bacon. And, of course, the bacon. But even the bacon flavors don’t quite come together the way they should, what with that whole burnt thing. I wanted so badly to love this beer, and I didn’t hate it, but the maple bacon style has so much potential that I was a bit disappointed. I can imagine a perfect balance of the sweet syrup and smokey bacon being absolutely delicious and even evoking memories of childhood — of waking up to these scents wafting through the house, heralding the oncoming Saturday. This beer didn’t quite make it there. And it’s a shame, too, because you can tell it was almost something special. Nonetheless, it’s an enjoyable novelty that’s worth trying if you love new things. Or bacon.